Tangle of pipes links Russia to the E.U. Russian pundits discuss who holds the aces in the relationship between Russia and the EU over gas supplies. In light of the Ukraine crisis and the sanctions imposed against Russia by the United States and the European Union, the issue of Russian gas supplies to Europe has become ever more relevant. The question is one of interdependency: Does Russia depend on the E.U. more than the E.U. depends on Russia, or vice versa? After the E.U. summit on March 21, British Prime Minister David Cameron claimed that Russia is more dependent on the European gas market. Cameron noted that in the case of possible E.U. sanctions, the E.U. should diversify gas supplies in the long term in order to be less dependent on Russia. Later, U.S. Secretary of State John Kerry declared that the U.S. would be able to supply more gas than the E.U. consumes. The agenda of the E.U. summit scheduled for June contains a point on the development of a plan to diversify gas supply sources and reduce dependency on Russian gas supplies. According to 2013 data from Eurostat, Russian gas accounted for about 25 percent of total E.U. gas supplies. However, the Baltic states, Finland, and several Eastern European countries are completely dependent on Russian gas supplies, and a number of other countries depend on Russia for up to 40 percent of their gas supplies. Russian gas supplies enable European countries to receive tangible economic benefits that amount to hundreds of billions of dollars provided for heating, power plants and businesses. This directly or indirectly creates thousands of jobs, and provides for the regular functioning of a whole host of core industries. In other words, there is a solid system of mutual economic benefit. According Laszlo Varro, head of the Gas, Coal and Power Market Division of the International Energy Agency (I.E.A. ), the E.U. countries are going to remain the largest consumer of Russian gas over the next decade. This is partially because of economic realities, since replacing Russian gas supplies will require significant financial resources, and the price for gas from new external sources may be substantially higher than the price for Russian gas. The E.U. policy aimed at improving energy efficiency is one of the steps taken to reduce dependency on Russian gas supplies, along with increases in the use of renewable energy sources. While energy efficiency policies have proven to be effective, hopes for actively developing alternative energy sources have not yielded great results. The E.U. 20-20-20 program, which aims to increase the use of renewable energy to 20 percent of the total energy balance in the E.U. by 2020, has been stalled. In order to fully diversify away from Russian gas supplies, Europe would have to resort to purchasing gas from other countries, which would require significant investments and a time period of 10 to 20 years. According to calculations by Stanford C. Bernstein & Co., Europe would need a total of $215 billion in investment over the next four years to completely shift away from Russian gas supplies. Moreover, European companies would have to pay fines to Gazprom under long-term take-or-pay contracts that will remain in effect until 2020 (and in some cases until 2035). The main part of the E.U. gas transmission system is adapted for the supply and distribution of pipeline gas. Additional supplies of pipeline gas from Norway are limited. As far as the construction of gas pipelines from the Middle East and Iran is concerned, there are severe risks to implementing projects there because of political instability. Gas supplied from Turkmenistan via the Trans-Caspian pipeline under the Caspian Sea along the Baku-Turkey-Europe route is also not an option because of the Caspian’s lack of a legal status. C Will ExxonMobil leave Sakhalin? What about supplies of liquefied natural gas (L.N.G.)? There are currently about 20 regasification terminals in Europe with a total capacity to receive about 190 billion cubic meters of gas per year. Yet according to British energy holding BG Group, L.N.G. imports decreased from 90 billion cubic meters in 2011 to 48 billion cubic meters in 2013, so the existing terminals are underutilized.Constructing new terminals is not always economically viable because of the specifics of L.N.G. reception and distribution. Among prospective L.N.G. suppliers in Europe, Norway, which can supply about 20 billion cubic meters of gas annually, is the most promising. Other suppliers include countries in the Middle East and North Africa, as well as those in the eastern Mediterranean. These countries have projects aimed at expanding gas production, constructing L.N.G. terminals, and exporting L.N.G.. But each of these projects faces a number of political and economic obstacles that impede their implementation in the near future. Gas supplies from the U.S. and Canada are tied to the shale gas revolution, and further growth in the scale of shale gas production in the coming years may face a number of economic and environmental problems that will act as major obstacles for a number of projects. Besides that, in order to export L.N.G. from the U.S., it is necessary to invest heavily in terminal construction on the east coast. This is possible only if American companies are absolutely sure that this gas will have a place in the E.U. marketplace at acceptable prices. At this point, market conditions are not favorable for supplying L.N.G. exports to Europe. The Baltic states and Eastern Europe would not be able to provide their populations with heat and electricity without Russian gas supplies. For other E.U. countries, the consequences would not be as catastrophic, but there would nonetheless be significant negative effects on the European economy. Halting Russian gas supplies would result in operational problems for 30 percent of thermal power plants, as well as for over 50 percent of metallurgical and chemical companies. If Russian gas exports were to fall by 25 percent by 2020, the country’s losses could amount to more than $15 billion. In order to compensate for these losses, Russia is activating projects aimed at supplying L.N.G. and pipeline gas to countries in Asia. In addition, Russia is planning to expand L.N.G. exports to China and other countries in the region. If the political problems that have arisen in the wake of the Ukrainian crisis continue, one thing is clear: both sides will experience negative effects, but these effects will be more significant in the E.U. It is also reasonable to assume that the Ukrainian crisis will be resolved and the Russia-E.U. gas supply partnership will develop in accordance with the interests of both sides, including in the framework of the Russia-E.U. Energy Dialogue. Regardless of political developments, significant changes in European consumption of Russian gas are unlikely in the near term given the existing infrastructure and contractual obligations. Stanislav Zhiznin is a professor at the Moscow State Institute of International Relations (MGIMO) and the president of the Center of Energy Diplomacy and Geopolitics. Russia and the countries of the European Union have been linked by gas supplies for a long time. The Soviet Union began to supply gas to Europe at the end of the 1960s. Then, the Soviet gas industry was at an early stage of development; supplies were shipped in limited volumes and only to neighboring countries. In Europe, the gas industry was also in its infancy — the development of a field in Groningen in the Netherlands was just beginning. Russian gas and European gas evolved over the same period, and in ways that have created deep ties. 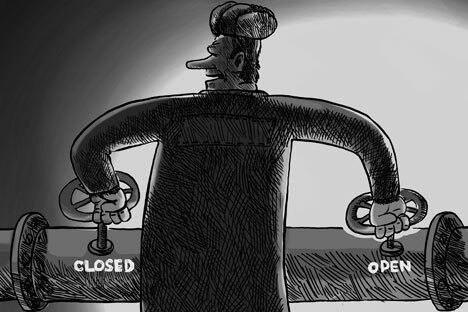 The story of the Urengoy-Uzhgorod Pipeline gives a good history of the relationship. In the 1970s, the framework of the Council for Mutual Economic Assistance (Comecon) realized a project for developing a large gas field in the Urals city of Orenburg and creating the Soyuz Pipeline for gas export. The most dramatic stage was the deal that provided for the construction of the huge Urengoy-Uzhgorod Pipeline, which would provide for the organization of large-scale exports of Russian gas to Western Europe. The construction of the pipeline, which stretches more than 3,100 miles (4,989 kilometers) was a massive undertaking, involving both Soviet and European manufacturers. The pipeline connects the Siberian gas field of Urengoy with the city of Uzhgorod in Western Ukraine. From there, gas can be supplied to countries in Central and Western Europe. The Mannesmann factories in West Germany were scheduled to provide a significant part of the large diameter pipes for this gas pipeline. Another portion of the pipes would be provided by a mill in the city of Khartsyzsk, in the Kharkov region of Ukraine. The Ukrainian plant had been producing these pipes for some time, but the German pipes were more suited to several sections of the new pipeline. Additionally, the number of pipes needed was so great that no single factory could be expected to produce them. The Italian firm Nuovo Pignone was contracted to provide gas compressors. Unfortunately, however, the project began just after Soviet troops invaded Afghanistan. The United States called for sanctions against the Soviet Union and, as part of the sanctions, the U.S. demanded that its European allies refuse to supply pipes and equipment to build Urengoy-Uzhgorod. Without the pipeline, the entire deal to supply Europe with Russian gas would fall apart.The United States, which was not a direct participant in the agreement, would lose nothing from its collapse, but the ramifications would be serious for many European countries. Nuovo Pignone pulled out of the deal because it was a licensee of the General Electric company and the United States had forbidden any components produced under American licenses to be used in the deal. The German companies, however, decided to supply pipes for the project anyway. The efforts by the United States to derail the construction of the pipeline was one of the most serious crises of the Cold War. In response to U.S. efforts, the Soviet Union ramped up compressor production to provide the necessary equipment. The production of gas turbines for use in the compressor stations of the new gas pipeline was launched in facilities used for constructing turbines for airplanes and ships. These compressors were inferior to what could have been produced in Italy in terms of their reliability over extended periods of time and their fuel efficiency, but they were necessary to solve the problem and the pipeline began operating on schedule in 1984. Later, a new generation of turbines with competitive indicators of quality was created through the joint efforts of both Russian aircraft manufacturers and Gazprom. The scale of the arrangement to build the Urengoy-Uzhgorod pipeline and provide gas through it was 8 billion cubic meters a year over the course of 25 years. This was one of the first examples of the kind of long-term contracts to provide Russian gas to Europe that ensured the stability of evolving business relationships, even in those years when Russia and Western Europe were part of two diametrically opposed systems pursuing radically different policies. In subsequent years, such large-scale pipeline projects as Yamburg-Western Border, Yamal-Europe, Nord Stream, Blue Stream, and a host of others were carried out to provide even more avenues for Russian gas to reach European consumers. A vast and expensive infrastructure was created through these projects. Gas was supplied to the former Comecon member countries on a barter basis. During the 1990s, when there was a transition to cash settlements and these countries faced an economic downturn, their gas consumption also decreased. The need for gas in Western Europe, however, has steadily grown, and Russian supplies, provided on a competitive basis, have likewise increased. There is much to learn from this short excursion into history. Today, gas markets are developing and, overall, the number of alternatives is rising. But there is no place for false illusions. Russian gas is still the most reasonable option for Europe. One potential alternative that has been discussed as a provider of gas to Europe is Qatar. This Middle Eastern state has spent a lot of effort creating more capacity for the production of liquefied natural gas. Taking into account its geographic location, Qatar was expected to supply gas to the three largest gas markets in the world — the United States, the European Union and the Asia-Pacific region.The shale revolution in the U.S., however, closed that market for Qatari gas. This surplus gas poured into Europe, which caused prices for gas to fall. This drop in prices coincided with the reduced demand of the 2008-2009 global financial crisis. At the time, a number of European experts were ecstatic that the value of what were formerly long-term type relationships for gas supplies had decreased. But after a few more years passed, the need for gas supplies in Asia-Pacific increased significantly. Prices were much higher in this region than in Europe and suppliers from Qatar reoriented their flows from the E.U. to Asia. In the E.U., the demand for Russian gas started to rise again — and this demand was satisfied. This was possible thanks to the current long-term contracts. Under normal economic conditions, this demand will continue into the future, and Russia and the E.U. will continue to be linked by pipelines. Vladimir Feigin is the president of the Institute for Energy and Finance and the Russian co-speaker of the E.U.-Russia Gas Advisory Council, E.U.-Russia Energy Dialogue.